This powerful report in the Students menu will create a list of student skill/level details and can be generated for a group of students or for an individual student. 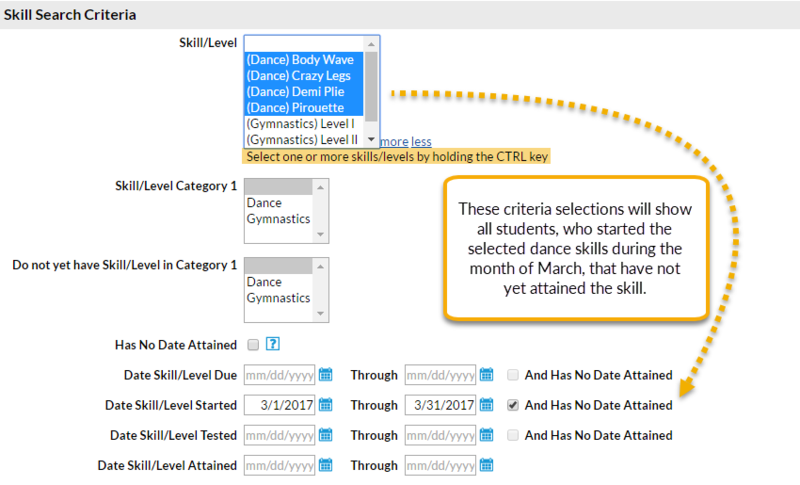 Run the Skills/Levels Search with the selected default criteria and display settings to see all skill/level details for all active students currently enrolled in classes with any instructor in any category. Numerous search criteria allow you to look at the skill/level detail for students at a highly customized level. You can use only one criteria or use several criteria combined to narrow the report results. Don't over select criteria to start with; this can filter a large amount of data out of the results. It is easier to start with fewer criteria and then pare down the results from there. Once you get the information you are looking for, save your selections as a Favorite for future use! 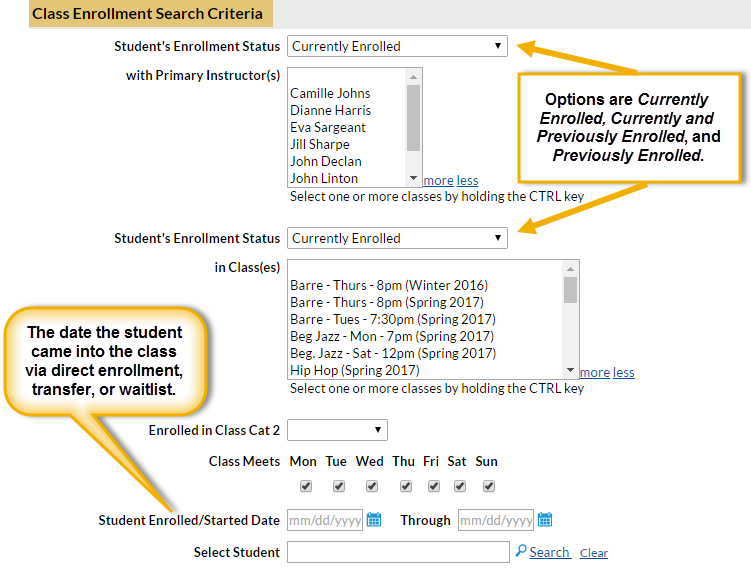 Use the Class Enrollment Criteria to look at the skill/level details for students currently enrolled in a particular instructor's classes or students who were previously enrolled in a specific class(es). Look only to classes that meet on a selected day(s) or look only at the skills/levels of students who started during a particular date range. Look at students who have started a skill(s)/level(s) during a specified time frame or students who attained a skill/level during that time frame. You can also use this report to look for students who have not yet attained a specific skill(s)/level(s) using the Has No Date Attained critieria. For those that do skill testing or evaluation for promotion to higher levels, searching for students that have a skill with No Date Attained is a way to identify students currently working on a skill/level who may be ready for testing/evaluation. This section of search criteria allows you to look at students based on the status of their skills: has skill/level & sub skills assigned, skill/level not assigned, hasn't started, hasn't tested, and hasn't attained. To search on students who have not been assigned any skills, use the Students Search in the Students menu with the Search Criteria Has No Assigned Skills = True.